commented on "Jim Root HH Tele Super Mirror Pickguard Dual Humbucker Fender Telecaster Stainless Steel Guard"
Get your best mirror on! 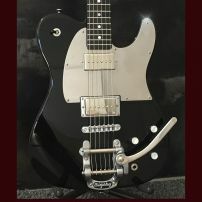 Designed to fit a Fender Jim Root Tele or any HH Tele with rear control routing and no Tele Control Plate. These Tele bodies also available from Warmoth Guitar Parts etc.